Chicago Bulls restricted free-agent guard Jimmy Butler has plans to pursue shorter-term offer sheets this summer, resisting the Bulls’ initial plans to offer him a five-year, maximum contract extension, league sources told Yahoo Sports. As the NBA’s salary cap is set to dramatically rise beginning with the 2016-17 season, Butler has become far less interested in locking himself into the five-year, $90 million-plus deal the Bulls are expected to present him on July 1, league sources said. For Chicago, there’s no challenge to retaining Butler. As a restricted free agent, the Bulls have matching rights on any offer sheet. Nevertheless, Chicago could be faced with Butler’s agents at Relativity Sports, Happy Walters and Steve McCaskill, loading up a short-term offer sheet that includes a trade kicker and the potential loss of Butler to unrestricted free agency in 2017. As Butler spends time in Los Angeles this summer, a stretch that’s included an overseas “Entourage” promotional jaunt with producer Mark Wahlberg, Butler’s intrigue with signing a potential Los Angeles Lakers offer sheet has increased, league sources told Yahoo Sports. Butler has preliminary plans to pursue meetings with several teams once free agency starts in July, sources said. Several teams pursuing Butler told Yahoo Sports that they’re under the impression a short-term, max money offer sheet is the wisest way to approach Butler this summer. Unless Bulls officials bring Butler a shorter-term deal that’s more favorable to his long-term earning power, they’ll likely be waiting to match an offer sheet, league sources said. Butler could sign a three-year offer sheet that guarantees him $50 million, but allows for a player option on the third year that could allow him to move into unrestricted free agency and re-sign for a five-year, maximum deal worth as much as $190 million. It is understandable why Chicago wants Butler locked into a five-year, $90 million max extension under the current salary structure, but that appears to be a deal Butler plans to pass on. Chicago has to sell Butler on a post-Tom Thibodeau era under Fred Hoiberg to get him fully comfortable with the franchise’s direction. What’s more, there’s an increasing belief surrounding Butler and point guard Derrick Rose that they need to come to a greater understanding about how to best co-exist on the floor. The Bulls understand that Butler had the staying power to turn down a four-year, $44 million extension (four-year, $48 million would’ve gotten the Bulls a deal, sources said) during an exclusive negotiating window in October, and they’ll have to wonder too: If there’s a player with the conviction to risk playing out the 2015-16 season for his $4.4 million qualifying offer and become an unrestricted free agent in 2016, it could be Butler. Nevertheless, that’ll be considered a long shot in the process. At 25 years old, Butler had his best NBA season, earning a spot on the Eastern Conference All-Star team. 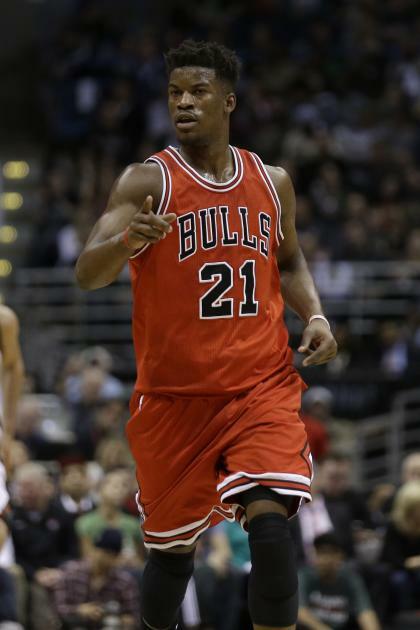 An elite two-way player, Butler averaged 20 points, 5.8 rebounds and 3.3 assists per game. His career averages are 11.7 points, 4.3 rebounds and two assists. He was the 30th overall pick in the 2011 NBA draft. He was voted the NBA’s Most Improved Player this season.